Our Liberators in Denver are passionate about creating residential and home office organizing solutions for busy families. Each person on the organizing team was born to organize. Although we love having nice and neat homes, none of the Liberators suffer from OCD. They lead normal lives and their households get messy just like everyone else. The secret weapon to creating and maintaining their peaceful households is called the Major Mom Method. Each Liberator has attended our intensive Major Mom Training Academy. 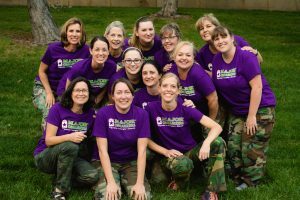 The Liberators are blessed with the gift of organizing and they are passionate about helping others conquer clutter, chaos and disorganization. Liberators is the perfect name for these troops! Liberator Truia has turned a nightmare situation into a dream come true by helping me identify the things of true importance in my old, cluttered home, and what was worthy of donation or sale. I truly didn’t know where to begin but Truia did! We completed our task in the nick of time for the buyer’s contractor to start work. I could not have accomplished this massive task without her guidance, not to mention her muscle! The dream will continue when Truia returns with teammates (platoon mates, perhaps? LOL) to help us organize our temp storage space (where I am holding a temp business selling old items) and our new apartment (which already looks like a couple of hobos have been camping there). I am longing for the freedom of true organization! Thank you, Major Organizers!!! Janet and Deanne were wonderful! They were extremely professional and very thoughtful about everything. They adapted well based on our needs and made this a lovely experience. Highly recommend. My husband and I have lived in our house for over 30 years. After we became empty nesters, our downstairs storage room and two guest rooms became cluttered with many years of odds, ends and memorabilia. Then our grandson was born and was coming to visit at Christmas and we were faced with a huge task of decluttering and making the two guest rooms habitable. We called Major Organizers in desperation. Janet and DeAnna came out twice and restored order and serenity out of chaos. Now we can look forward to celebrating Christmas in our home! Thanks to both of you! Major Organizers was tremendously helpful with my project. Their service is quick, easy, and pain free, leaving me feeling 100% better than before we started. Their staff is friendly and professional and most importantly they’re great at what they do! I highly recommend Major Organizers. Major Organizers, Janet specifically, has helped me finally get over the hump of getting my home in order! Having professional help has given me both an experienced sounding board and a much clearer path to both beauty and simplicity in my home. Our home has become more usable and welcoming to friends and family and we are excited to use beautiful things we love. In less than six hours Jane and her team transformed my home from a sate of overwhelm and chaos into a peaceful and orderly space. What I have been attempting on my own for months was achieved in a matter of hours – my only regret is not doing this sooner! I can now enjoy my home again and feel inspired and energized to keep it up in the future. We were stuck with too much stuff and nowhere to put it. Kara and Truia were so helpful and understanding. I’ve made a huge amount of progress in a limited amount of time. I’ve been using Major Organizers off and on for about 6 years! Most recently we had the pleasure of working with Lyndsie. She was very respectful and non judgmental when she saw the mess in my house! We worked together and were able to organize the kids playroom and home office. I would highly recommend Lyndsie to help you with any of your home organization. Kara and Truia were extremely hard working and helpful editing all the stuff in our basement. Friendly and professional! I had the pleasure of working with Lyndsie and Janet. Once again working with Major Organizers has been worth every dollar! Lindsey and Janet are a power duo!! Amongst chaos they were able to come in and power through three rooms in two four hour sessions, what would’ve taken me probably a couple weeks; and I still would’ve had to fight my family on trying to help me get rid of the things that we just needed to let go of in order to have a decluttered organized home. That Lyndsie I tell you she is no joke! She is there to help you focus and make those hard decisions when having to release those things that you really just have to let go of, in order to move through this process. So if you are in need of that kind of structure and help then these ladies are for you. I could go on and on about the benefits of Major Organizers, bottom line is if you are in need of getting your home and life in order, then they are the people to call! You will not be disappointed! Thank you Major Organizers and especially Lyndsie and Janet. My home,my state of mind, and my life would not be the same without the help that you gave to me. Lyndsie has helped me to organize my master bath and a lien closet so far. I moved half way across the country from a 3400 sq ft home down to 1500 sq ft home. It was Overwhelming trying to figure out what to get rid of what to keep, where to put things. With Lyndsie assistance we have completed each area quickly. I was able to let go of many items I really didn’t need any longer. Lyndsie will be coming back to tackle the next area of my home soon. With each visit I am inspired to take on smaller “to do items”. Also Lyndsie could tell I was not ready to tackle my home office the first time she came, she asked questions and figured out the starting in the master bedroom / bath would help me to free up some energy. So the next visit I might be successful in the office. I can not wait for our next block of hours to work through more stuff. Thank you. Conscientious and professional team members! Start to finish constant movement. The end result is terrific and we are ready to move on with life! Thank you! This experience has done so much for me as a person inside and out! Outwardly the items which needed attention have been tended to with the utmost care and love. 200% satisfaction, however inside of myself I feel a change as well. I feel cleansed from worry, indecisiveness, neglect, disbelief of change, and imprisonment. My certified Liberator has literally changed my life. Thank you, Truia. Went above and beyond my wildest expectations. Fantastic! Biggest help in the world! We had a great experience with super knowledgeable organization wizard, Trulia, who got us ready for our international move. We could not have done it without her! Kathy came and assessed my projects, discussed options, and set out to organize a major disorganization in my office. Now, I can easily find what I’m looking for and put my hands on what I need quickly! Going into my office is a pleasure now! Kathy’s friendliness and non-judgmental approach made this huge job so much more enjoyable! Thank you Major Organizers and Kathy for your professionalism and great organization! You’ve been a lifesaver. It was a worthwhile investment in my life! Amazing improvement/transformation of my home office space! I feel like I can actually breathe in my office, and get work done without being distracted by all the clutter. Thank you Major Organizers! Janet was fantastic and we got so much done in a pretty short period of time. Much easier than doing it myself. Thank you! Everything went so smoothly and efficiently. The ladies who came to help my unpack & organize were a joy to work with and it was actually a pleasure. My new home not only looks amazing but functions so much better. I will definitely be calling their number for my next move. Kathy and Joan organized and cleaned out my basement, play room and my art and activity room. They found a place for everything and created easy to use solutions for my children as I requested. This is my second time working with Major Organizers, and once again, I am blown away by their expertise, professionalism, and ability to change my space in such a short time. My only regret is waiting so long to get them back to transform my garage! What a relief to have this project complete. Major Organizers has been an unbelievable help to us during the unpacking after our move to Denver. They calmly and professionally were able to unpack our boxes and organize everything into the right pace then let us know where it was by labeling with post its. They independently do what needs to get done and are amazingly efficient. I will definitely be using them again, they have been worth EVERY penny! Excellent job and service. The team arrived on time, worked efficiently, communicated throughout the entire process, and finished as scheduled. I highly recommend Major Organizers. Deanna was fantastic at helping us create organization plans that work with all our needs. She was really flexible to give us what we want – workable plans that we ten refine. We has her come back to organize the basement/garage after the office because she suggested ideas that we would never have come up with. I particularly thrilled she consolidated office files and activities which is obvious for the from the outside but which I never would have done in this house because of our original set up. It made our lives much much easier. I have been so pleased with my organization system Major Organizers set up for me. I couldn’t find a couple of things but I looked at our labels and it was found. I also got way messy after starting a new job, but when I started cleaning up last Saturday I was able to put EVERYthing in its proper place. I am so grateful for the help I received from Major Organizers. I was 8 months pregnant and in the middle of a very busy time at work. They came in and helped me get our house ready for the new baby in one day! They helped me get 2 of our daughters moved into the same room, organized the nursery for the new baby, and helped me organize all the toys in thee family room. I had been stressing about these tasks for weeks! They were quick, professional and had great ideas. They just sat me in a chair and had me sort through what to keep and what to toss. Thank you Major Organizers! Major Organizers is truly amazing! We organized our children’s bedrooms, closets, and play room with Stacey and her Team which was game changing. Our children have more respect for their belonging and keeping everything organized. Stacey is warm, professional with a can-do attitude. Our home feels lighter and we no longer feel burdened to “organize that closet eventually”. It is amazing! I am extraordinarily grateful for the time I spent with Stacey. She is kind, thoughtful, efficient and REALLY good at her job. I didn’t know what to expect from my time with an organizer. I didn’t have a set project chosen, just a vague idea that there were a couple areas in my home that felt chaotic. Stacey arrived ready to work. We sat for a moment to take care of paperwork and to identify my intentions for the day. As we walked through my entire house, Stacey listened and watched my body language to know where to focus our time. We tackled the living-room first. The TV area has always been messy and frustrating to me. 13 years of living in my home, feeling frustrated by the mess every time I walked in the front door Stacey offered several suggestions and eventually helped me to arrange the area so that the extra clutter was all gone. Although I will eventually invest in a new TV, she helped me work with what I have to make the living-room inviting. Next we moved into the dining-room. The room is transformed. Stacey identified areas that felt crowded and out of sync. We rearranged the furniture so that the lines are clean and open and the furniture coordinates. My goodness, what a difference a professional can make. I could not be more please. We worked the entire time. Stacey guiding the process. She encouraged me to think about my possessions with a critical eye. She was so kind and non-judgemental. We all have things in our lives that we don’t love, but can’t seem to part with because of an attachment to another person. She gave me permission to find other ways to honor my family without being stuck with their old stuff. I will plan another session with Stacey in the future. This is an investment that absolutely pays off. I feel a sense of peace and contentment in my home as I look around at the work we accomplished. She helped immensely before my move, sorting and getting rid of stuff in order to downsize. Then, in my new place she helped me unpack and organize the closet and kitchen. I couldn’t have done it myself! My garage was an absolute MESS. I called Major Organizers to help get it under control. After Dylann came in and worked her magic, I can honestly say that my garage is neat as a pin – and is crazy organized! I know exactly where to find everything because the organization doesn’t just look good – it makes total sense and is highly functional. I thought I would just be happy to not have “clean and organize the garage” on my to do list anymore – but is’s so much more than that. I’m super happy every time I walk or drive in there. Thank you, Dylann!!! Excellent, skilled, thoughtful workers. I enjoyed working alongside them. Renee and Angelica were amazing! They were very respectful of my things but were really good at helping me realize what was really worth “treasuring”. They were always on time, worked non-stop and had truly creative ideas about getting my son and myself organized. We love our home now. Major Organizers go the extra mile to help you get the best out of your home. It was a pleasure to work with Renee and Angelica because they always had a smile and boundless patience. I can’t thank you enough for all your hard work!! You can hire them without a pause, you’ll be guaranteed to be pleased. Hats off to Renee and Janet! A day before the inlaws arrived I met with Renee – the next day she and Janet came over and 5 hours later my house felt great. Renee had a great concept for how to reorganize how my family uses space. From a basement I used as a closet, to a really comfortable, welcoming, useful space. Many thanks! I could not have possibly been happier, I actually almost cried tears of joy when I saw everything they did to help me. I’ve already recommended you all to about 7 people. Thank you for helping me get my life and home in order. Wonderful Wendy just keeps getting more wonderful. My big walk in closet actually has a floor. My clothes are organized by type and color and there are labeled rings around the rods like a department store. Wendy has a great since of humor and very creative ideas. Janet, Samantha, Renee, and Wendy did an excellent job. They were great to work with and did it all with a smile on their face. The condo does look like a home now. I thank Major Mom big time for helping me with a complete disaster! I recently did a series of projects with Major Mom and had a great experience. We spent about 20 hours together and in that time organized my kitchen, utility closet, garage, children’s bedrooms, craft closet, and basement. We managed to get to almost every space in my house that needed to be organized! I worked with Kara Gonzalez and really enjoyed her. I am a person who has an easy time letting belongings go and I also periodically organize my spaces on my own. So, I was a little skeptical that I needed any help at all. But, I’m so glad I gave them a try. I worked together with Kara on the project (as opposed to having her do it herself without me) and I was amazed at how her expertise was able to take my skills to the next level. It’s been many months since we first started and every space is exactly as organized as it was the day we first did it. Well worth the money to be ready for the move! Our home is more functional and definitely more manageable by all. Our family is enjoying the refreshed look and feel of our home. Many thanks to everyone on our project for getting us to where we can enjoy and relax in our space knowing what we have and where it is. Less is more! It truly is liberating! Denver, CO. Mom of 2. Wonderful Wendy just keeps getting more wonderful. My big walk-in closet actually has a floor. My clothes are organized by type and color and there are labeled rings around the rods like a department store. Wendy has a great since of humor and very creative ideas. I am thrilled with my work with Major Mom. Mandy took the time to ask lots of questions and has helped me set up some systems that will actually work…rather than create new ones. I am excited to get through my to-do list! I wanted to write about Wendy. She came to our home in Denver 3 times now, every time I was more and more excited and happy with the results. Something about her just wanted me to purge and live a happy organized life. Even when it was hard, she made is easy! Only caveat to getting your house in order is becoming addicted to seeing results and wanted to only do this! I am having a hard time working today, I am thinking about rooms in my house that I can go do some magic in.. ha ha!